A tight budget can lead to poor wine choices in Florence. You find yourself buying €3 bottles from shops that are no more Italian than you are, and the lingering aftertaste of vinegar won’t let you forget. 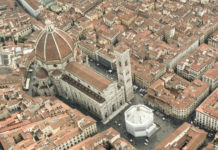 Are you ready to discover one of Florence’s most intoxicating secrets? Here are two little words that will forever change your wine experience in Italy: vino sfuso. 1. What is vino sfuso? Translated word for word: “loose wine” (no, no, not “promiscuous”… “unpackaged” ). More properly defined: bulk wine, dream come true, wine on tap, wine from the cask (the barrel or container where wine is fermented, matured, stored or shipped). 2. How does it work? 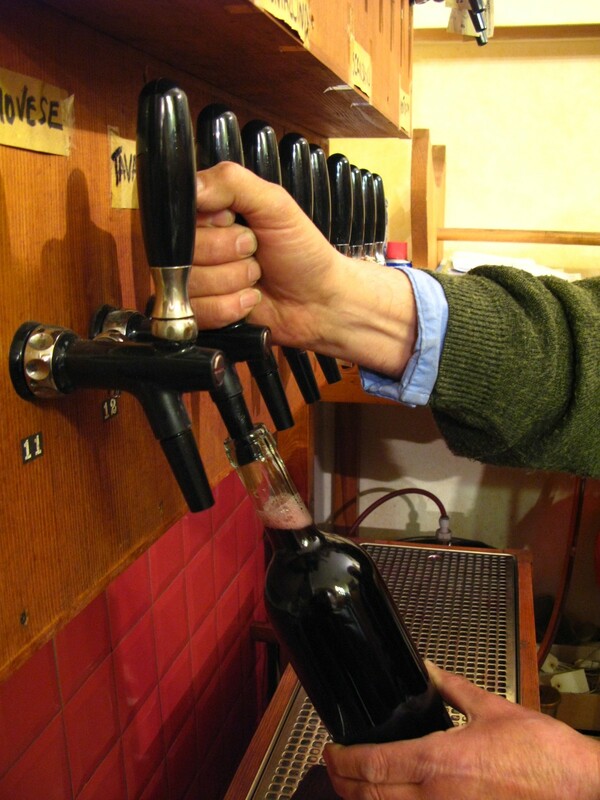 Wine is tapped directly from the cask or pumped into a line of taps (like at a bar). 3. What do I put it in? How creative are you? The beauty of vino sfuso is that you can bring your own container as big, small or imaginative as you want. Empty bottles, bag-in-boxes and jugs are also available to purchase in store; but that wouldn’t be as fun as filling your 2-liter water bottle with Chianti, or such a lovely shade of eco-friendly green* as reusing the accumulations of depleted drinking receptacles laying around your apartment. *Drinking vino sfuso from a recycled bottle, instead of regular bottled wine, is technically contributing to saving the environment. If you needed an excuse to drink more, you’re welcome. 4. How much does it cost? €1.50-€3 for a bottle! 5. Why is it so cheap? Because you’re just paying for the wine, not a glorified brand name, glossy label, or fancy bottle. It used to be that vino sfuso was made from the grapes that didn’t make the cut for higher priced wines, but these days, vineyards are dedicating themselves to its specific production. 6. Does it actually taste good? Yes. In fact, if you’ve been drinking customary bottled wine of the same price, it tastes great. Why you might not want to ship a bottle home for your uncle the sommelier, or present one at the wedding of your host family’s daughter, it’s perfect for regular people drinking on everyday occasions. It’s what Italians call “vino da tavola” (table wine). 7. Can I taste if before I buy it? What might just be the greatest of the great things about vino sfuso is the positive answer to this question. And, for free. Although you may hold a high score at the in-store guessing game (Notes of burt cedar? That sounds interesting. €29? That must mean it’s good. Your Italian teacher recommended it? Sold. ), nothing beats a good, old-fashioned taste test. Choosing wine is personal. If notes of lavender flowers don’t do it for you, it doesn’t matter if the bottle is on the world top 100 list; you don’t like it. Enjoy the precious gift of being your own judge; describe what you like to the shop employee and taste at least a few options before taking one home. 8. Why is it better than the same priced wine elsewhere? If you pay €3 euro for a bottle of wine at the grocery or liquor store, you get maybe €1 of quality and at least €2 of bottling, packaging and transportation costs. Whereas, if you pay €3 euro for a bottle of vino sfuso, you get basically €3 worth of quality. Plus, vino sfuso comes from the region where you buy it. With every sip, you’re supporting the city and familiarizing yourself with the flavors of where you are. 9. Can I drink it in the store? Usually no. Most vino sfuso shops don’t have la mescita, the license to sell glasses of wine to enjoy on the spot. But, you’re in Italy, where drinking on the street is legal! Just ask for some plastic cups and find your way to the nearest piazza to drink your bottle under the Tuscan sun, by the light of the Tuscan moon, or in the company of the Tuscan community. 10. Where can I get vino sfuso? Your best bet is to ask this question at hotel reception or your language school. Vino sfuso is sold at some local vinaini (wine shops) in Italy, but these tiny stores are often hard to find and not listed on Google maps. In Florence, our favorite place is “Bacco Nudo!” (“Bacco” is the Roman God of food and wine, and “nudo” means “naked.”) The shop is owned by twinkling blue-eyed Simone, who was sweet enough to purchase the store to give his equally blue-eyed son, Matteo (sorry, girls; he’s taken!) a job. What actually happened, is Simone ended up going back to work after his retirement. He devotes his should-be time off to seeking out the best wines and typical products in the region, proudly arranging his finds on Bacco Nudo’s shelves, and hand-writing the in-store signage with care. Come say, “ciao!” He’s waiting attentively behind the counter to meet you. Have you tried vino sfuso? Did it change your life like it did mine? There is a great vino sfuso shop in Piazza delle Cure- just as you exit the sottopassaggio! I know personally the two enoteche in Borgo la Croce…and I really recommend them! With 2,5€ you can buy a liter of very good and genuine wine! Guys, stop buying poor cheap wine at the supermarket…go to the Vinainos’ shops around the city, find the nearest and have fun! There is a great little store by the san lorenzo market too.. Just 5 steps from ‘zaza’….